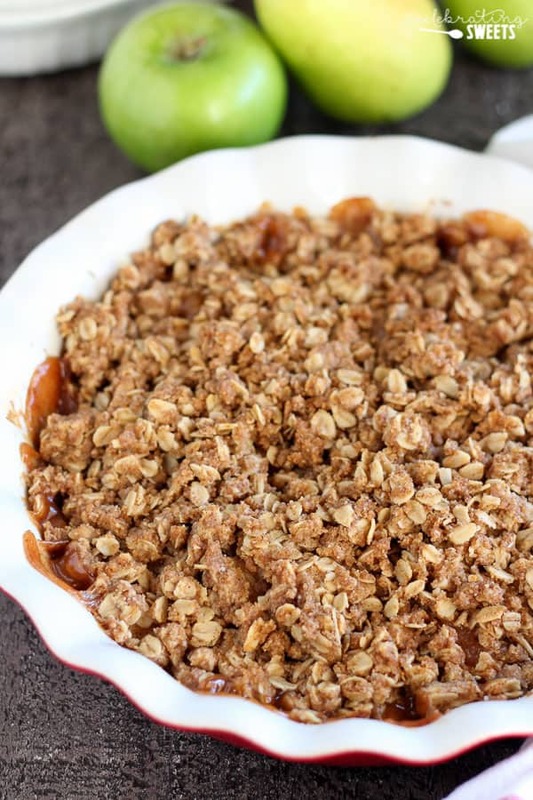 Apple Pear Crisp – Tender apples and pears baked with a brown sugar oat topping. Serve warm for the perfect fall or winter dessert! Hello, friends! Are you in Fall mode yet? Are you spending weekends watching football? Treating yourself to something pumpkin-y? Helping your kids choose their Halloween costumes? I answer a big fat “YES” to all of the above. I love this time of year! I’ve spent the last several weeks baking with pumpkin and apples and, although it felt a little premature, I enjoyed every second of it. 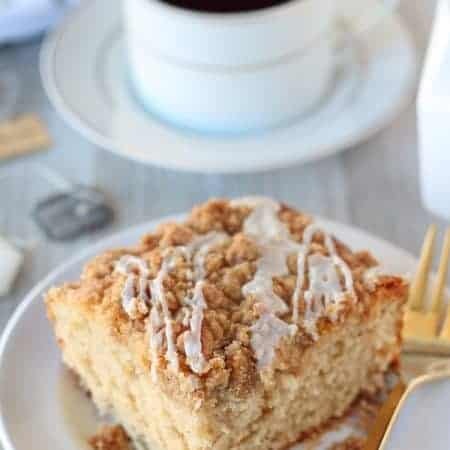 I’ve come to the conclusion that food bloggers and Starbucks are responsible for somehow slowly moving the start of Fall earlier and earlier each year. For that I’m sorry, but, we can’t keep delicious recipes like this to ourselves. Apple Pear Crisp, anyone? 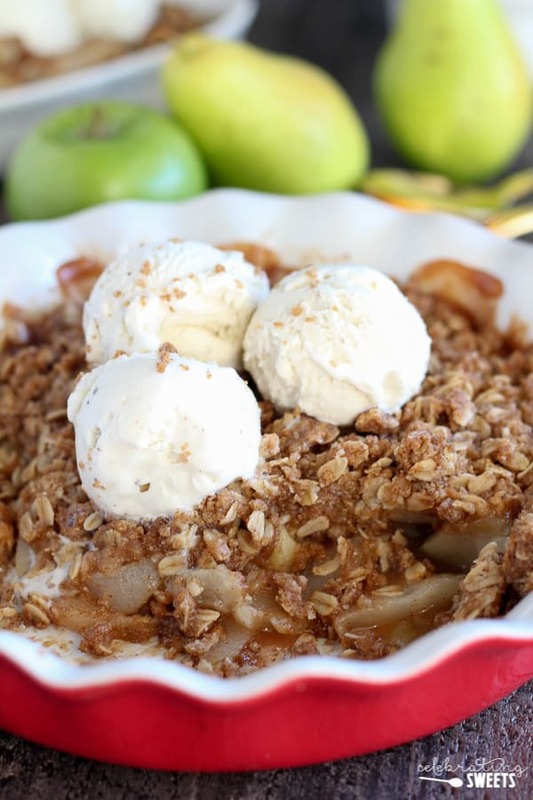 One of my first apple recipes every fall is some type of apple crisp. I decided to switch things up this year and add pears to it also! 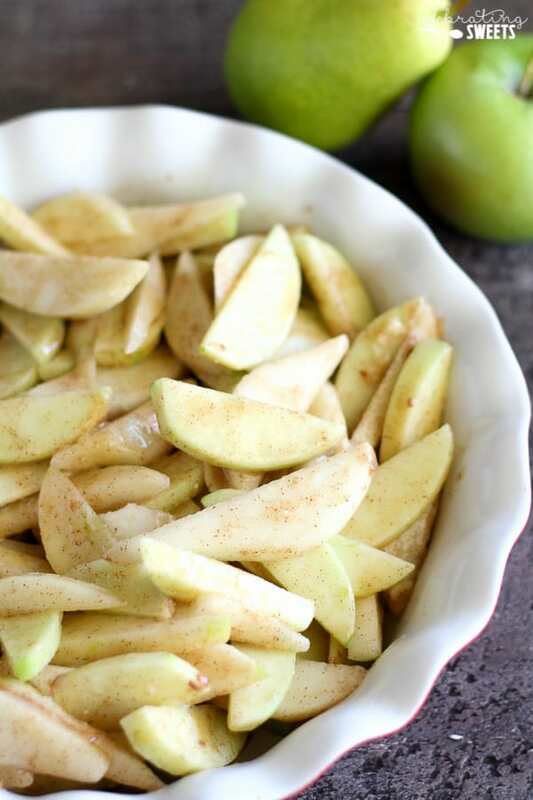 Apples and pears are a match made in heaven! 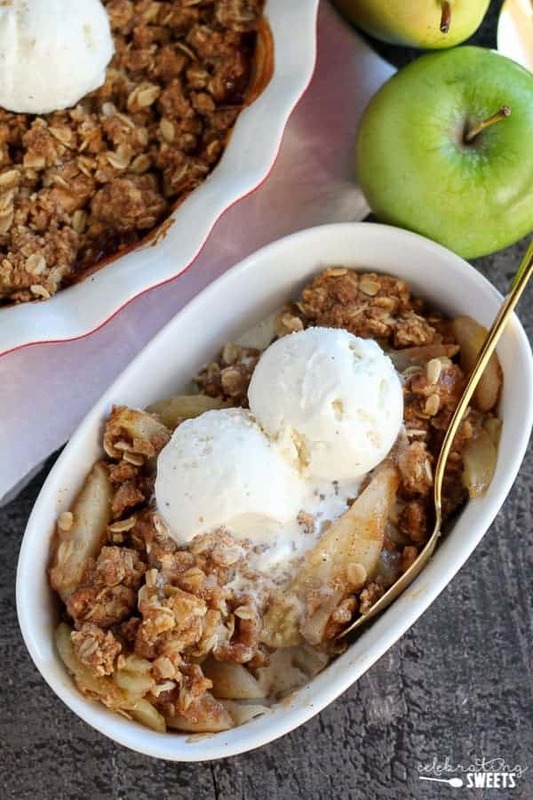 Juicy and tender apples and pears baked with a buttery brown sugar oat topping – this is sure to be one of your favorite fall and winter desserts. This recipe is pretty simple and straightforward. The important thing is to make sure your apples and pears are cut fairly thin so they don’t take too long to cook. Another important note: please do not forget the vanilla ice cream. Do you see that melted ice cream river in the photo above? That is what dreams are made of. 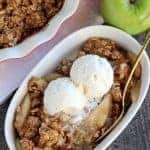 Technically, you could skip the ice cream, as this fruit crisp is wonderful on its own, but, I have never met a fruit crisp that wasn’t made even better by topping it with a scoop of ice cream. I will always and forever eat my fruit crisps warm with a generous scoop of vanilla ice cream. I couldn’t call myself your friend if I didn’t tell you to do the same. Wait until you smell your house while this beauty is in the oven. You’re going to be so eager to dive into it. 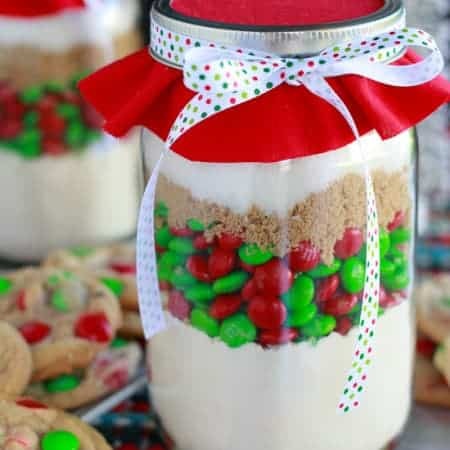 Get baking, and enjoy every last bite! Happy Fall! 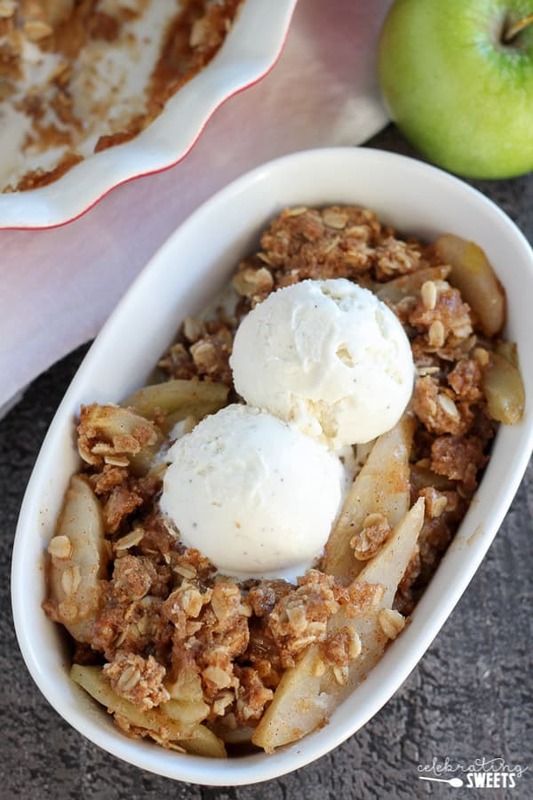 Tender apples and pears baked with a brown sugar oat topping. Serve warm for the perfect fall or winter dessert! Preheat oven to 350°F. Grease a 9 1/2 inch deep dish pie plate (or similar sized baking dish). Set aside. In a large bowl combine pears, apples, orange juice, granulated sugar, flour, cinnamon and vanilla. Stir gently until completely combined. Dump the mixture (and any accumulated juices) into the prepared baking dish. For the topping: In a separate bowl, combine oats, flour, brown sugar, salt and cinnamon. Add melted butter and stir until combined. using your fingers, crumble the mixture over the fruit occasionally pressing some of it together to form clumps. Bake for 45-60 minutes, until the fruit is tender (check it with a sharp knife), the top is golden brown and it is bubbling around the edges. Serve warm with vanilla ice cream. Apples and pears should be sliced 1/4 inch or smaller. This post originally appeared on Julie’s Eats & Treats where I am a regular contributor. Yum! There are few things I love better in fall than a good fruit crisp. This looks great. And, yes, the ice cream is a necessity. My husband would go to the store and buy some if I didn’t think ahead enough. For us (especially him), ice cream is not just a topping…it’s an integral ingredient. I love the combination of apples and pears! 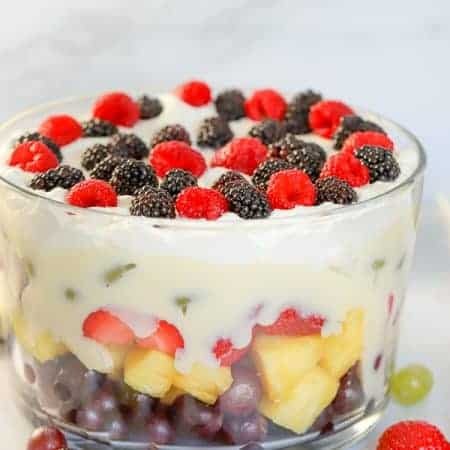 Great dessert for fall and winter! I made this delicious dessert for a family gathering this week. We loved the dessert so much that I’m making it again for another dinner party I’m having next week. Thanks for the yummy recipe!